What is an electric car? What is a hybrid car? What is a plug in hybrid car? What is a mild hybrid? 7 year warranty, comfortable, 7 seats,excellent tow car, nice to drive. Some wind noise from the roof rails which I will never use,it would be useful if they were removable. Attractive lines for a 7 seater. Well equipped, comfortable seats. Like rear view camera as I have a tricky curvy drive with many obstacles to back off of. The manual is all encompassing for all model types so you continually need to check if your model has that functionality. Also received 11 or so books on SatNav in different languages. Threw all but English away. Waste of paper/resources. This is my second Sorento, the first being a 2013 model. I have not yet towed with the new one but if it's as good as the first it's an awesome tow car. Quality build. Lots of tech features even on the KX-2. Lack of choice in paint colour! Fuel Economy is nowhere near the figures quoted at time of sale. Clutch seems very delicate, slow speed manoeuvres like reversing into a parking space often result in the small of burning clutch. I don't think I'd want to do any manoeuvring with a caravan in tow. 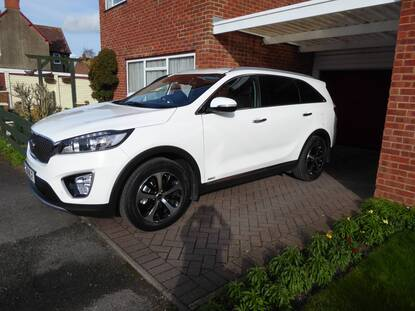 The Sorento is a spacious seven-seater that is attractively styled, easy to drive and with a genuinely upmarket feel inside. It's one of the best SUVs on sale today. Request a Test Drive Book a test drive with your local Kia dealer. Request a Test Drive Book a test drive with your local Kia dealer. Request a Brochure Download a brochure today. Request a Brochure Download a brochure today. Configure Your Car Design and build your perfect Kia. Configure Your Car Design and build your perfect Kia. Find a Dealer Find your nearest Kia Dealership. Find a Dealer Find your nearest Kia Dealership.